During a CNN town hall on Thursday night, on the eve of a vote in the House that is expected to give Congress final approval to begin gutting the Affordable Care Act, House Speaker Paul Ryan was asked a question that’s weighing on both Obamacare advocates and rank-and-file Republican lawmakers. “Why would you repeal the Affordable Care Act without a replacement?” wondered a Republican small-business owner and cancer survivor. After noting that he’s happy the questioner isn’t dead, Ryan described what a disaster Obamacare is. “The law is collapsing, and so we’ve got to rescue people,” he said. This sounds reassuring, until you consider that Congress will probably advance its effort to repeal Obamacare on Friday, and the Republican replacement plan still doesn’t exist. Republicans are heading toward a bitter fight over two competing cornerstones of modern conservative ethos: the read-the-bill, take-our-time, Schoolhouse Rock mantra that fueled this decade’s tea party revolution, and their utter hatred for the Affordable Care Act. “We just want more specifics,” Rep. Mark Meadows (R-N.C.), chairman of the conservative House Freedom Caucus, said Wednesday. “We need to know what we’re going to replace it with.” Meadows said he was personally undecided on his vote Friday and that other caucus members were leaning toward no. Rep. Charlie Dent (R-Pa.), chairman of the moderate Tuesday Group, said members of that caucus have “serious reservations” about starting the process without replacement plans spelled out. “We’d like to have this conversation prior to the repeal vote,” he said. 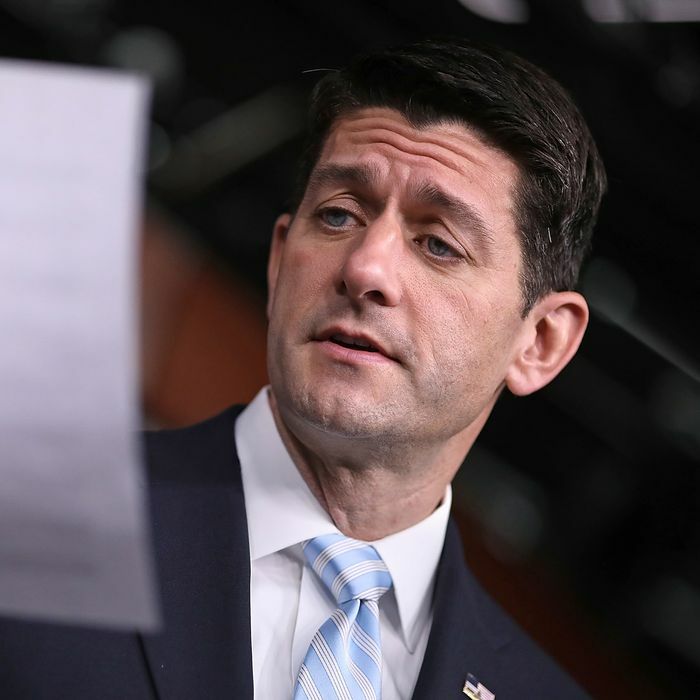 The solution Ryan and other GOP leaders have come up with is to begin the repeal process while assuring their wary colleagues that this week’s votes are just procedural. They’re correct that, technically, the votes held this week won’t repeal Obamacare. It’s the first part of a confusing three-step procedure that will allow them to defund Obamacare through budget reconciliation, bypassing a Democratic filibuster. The Senate just passed a budget resolution, and once the House approves the legislation the committees can begin working on how to do away with parts of Obamacare (but only aspects that relate to the federal budget). Once they agree on a plan, it will go up for a vote in the House and Senate. If it gets a simple majority, Obamacare will be defunded, with the president’s signature. The legislation being voted on this week sets January 27 as a nonbinding deadline for the committees to come up with a plan to repeal the ACA. There’s no deadline for enacting a replacement plan, which would require 60 votes in the Senate to pass. Trump stated that the Senate must repeal Obamacare “probably some time next week,” and that “the replace will be very quickly or simultaneously, very shortly thereafter.” That is completely impossible. It takes months to design a comprehensive reform plan for one-seventh of the economy, even if you have a party committed to a shared vision. Then at his press conference on Wednesday, Trump said he’d be “filing a plan” as soon as Tom Price, his pick for Health and Human Services secretary, is in place. His confirmation hearing hasn’t been scheduled yet. Thursday, at his weekly press conference, Ryan confirmed that Republicans won’t magically repeal and replace Obamacare “some time next week.” He suggested details on the GOP plan will be available after their congressional retreat, which will take place the week after the inauguration. The House speaker and the president-elect are indeed perfectly in sync, in that little about their stated vision for the repeal and replace of Obamacare makes sense. Correction: A previous version of this post incorrectly stated that the president does not need to sign the legislation to defund Obamacare. We regret the error.